I've been thinking a lot about truth. I've been thinking (often at 4 a.m.) about how to get at the real truth of a person, or an event. I've been obsessing about it because of my work-in-progress, but the search for truth has been in the news a lot lately, too. Election season always brings out the question of truth. But these days so do extreme weather events (yes, folks, global warming is real, and yes we will be having more and more of these heartbreaking disasters like the typhoon in the Philippines unless we deal with it!). And the past few weeks our country has been looking again at John F. Kennedy, and his truths. This Friday is, unbelievably, the 50th anniversary of his assassination. As a country we are still fascinated with the man, and obsessed, some say, with his death. I think the reasons are obvious and reasonable, though one journalist argues that our obsession with him is just our obsession with ourselves--if we are baby boomers. But there are new sources (see below, On the Media), and new insights. And so new books keep coming out, textbooks are revisited, revisions made, appraisals rewritten. You talk to some people of a certain age and they do not budge from how they felt about J.F.K. the moment they heard the horrible news on November 22, 1963. (See below, me.) You talk to others of that age, or a younger age, and you get an emotionless appraisal of a man who was President for a very short time. For a really good summary of how we are looking at J.F.K. right now, including some newly-released tapes, listen to this week's "On the Media." That's one of my favorite N.P.R. shows, by the way, because they are always in search of truth and how truth is reported (or not reported). I highly recommend it. Those of us who write know that it is darn hard to get at the truth. I mean not only the facts, but the core truth, the deep essence of a person or an event or a subject. 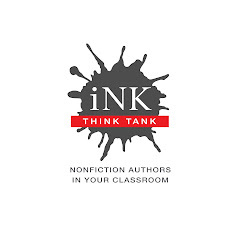 Sometimes it takes a lot of creativity to keep it nonfiction. And sometimes, writing it as fiction is the best way to go (see below, Monica Edinger's new book). Getting the facts right is just one part of telling the truth. For one thing, when you write for kids, you have to tell the truth, but sometimes, depending on the age, not the whole truth. But getting at the truth is more complicated and complex than that no matter who your audience is. To get at the truth you have to sift through your own preconceived notions, your own bias, other peoples' bias, untruths perpetuated throughout the years, lack of facts, etc. And at bottom is the challenge of understanding what facts you have well enough to convey the truthful essence of a person or an event. Over ten years ago, an editor asked me to write a book about John F. Kennedy. I said no. I didn't want to learn more about him. I was only five when he was killed, and I knew that if I wrote a book about him, I'd discover painful truths that would ruin the kindergarten perception I struggled to maintain. The editor, apparently desperate for the book, and fast (so it would be published at the 40th anniversary) raised the advance she was offering (I didn't mean to be bargaining! ), begged a little, made a strong case, and finally I said yes. I am not sorry I did. 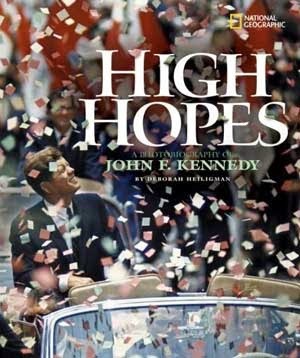 Writing High Hopes was a great lesson in how to find the truth--or a truth--about a historical person who was iconic in my childhood. As far as I know there are no mistakes in that book, although one review criticized it for being too awestruck. I was too awestruck by the man--when I started. If that reviewer only knew how much of my awe was struck down by research! And still, if I wrote that book today, with ten more years of distance from the trauma and ten more years of jaded experience or, er, wisdom, I would probably write a different book. Slightly different. More emphasis on his foibles maybe? And since it is a different world today, I might have included a reference to his dalliances. Maybe. (I decided the fact that he hid his illnesses was a truth I should tell; the affairs ended up on the cutting room floor, for, I felt then, good reason.) But does that make my take on JFK in High Hopes less true? No, I don't think so. But that does not mean it was the only way to tell the story, or that my book shows the only truths about J.F.K. for 4th, 5th, and 6th graders. Yet ten years later, I am still proud of it, and grateful for the experience of writing it. And I still believe that I captured a true J.F.K. Sometimes you can't, as someone once said, let the facts get in the way of a good story. Or possibly in the way of truth. For what about getting at a truth when you don't know all the facts? Sometimes, I have learned, and seen, you have to turn from nonfiction to fiction. As I wrote a long time ago here, I had to jettison a story because the facts were just too elusive and mushy. I hope to turn that story into fiction one day, telling truths, still, but not relying only on facts. As much as we are all about nonfiction on this blog, I'd like to put in a good word for great historical fiction. Sometimes the best way at a truth is through fiction. It just happens. Take a look at Monica Edinger's story about her road from nonfiction to fiction. 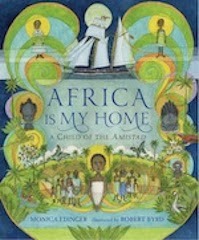 And then take a look at her beautiful--and truthful--new book, Africa Is My Home. In it she shows us the real story of a real person, Sarah Margru Kinson, one of four children who forced to come to this country on the infamous slave ship, The Amistad. I think this book should be taught alongside nonfiction about slavery and the Amistad. It gets at the truth the way Laurie Halse Anderson's brilliant Chains and Forge do. Sometimes the way to tell a truth is through meticulously researched historical fiction, as both Anderson and Edinger show. Now speaking of the truth and getting at it--I'm taking a break from I.N.K. blog posts to focus on getting my W.I.P. down on paper in the best and most truthful way that I can. I hope to be back by late winter or early spring. I'll keep reading I.N.K., of course, as I hope will all of you. Ditto! I will miss your comments but look forward to future reading about all the truths you discovered in your W.I.P. "The truth will set you free, but first it will make you miserable." 20th President James A. Garfield, b. this day in 1831, Just for you to know. Thanks Jim and Susan and Cheryl. And Cheryl, I love that quote! That is so true in so many instances! I almost included this gif where a stick figure is banging furiously on a keyboard, bashes his (her?) head, and then there is blood, and eventually a defaced and deformed person. Who might even disappear. It is gruesome, but funny. Gruesome, but funny, but true. We'll miss you Deb and your smart pov.